I’m sure that everyone, whether you’re a parent or not, has heard all about Build-A-Bear. But, I have a confession to make…I’ve never been inside of one. When we were asked to review a Build-A-Bear, my kids & I were excited and said yes! We chose Cheerful Monkey dressed as a Super Hero. 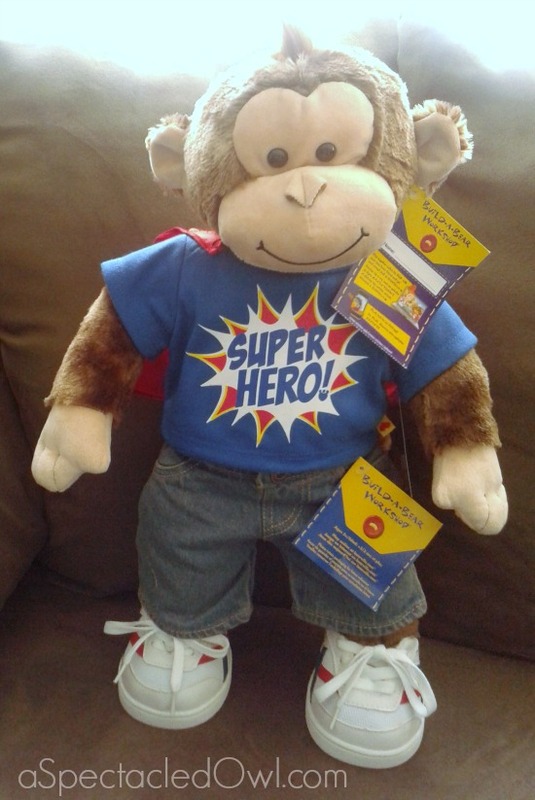 Cheerful Monkey came dressed in a Superhero T-Shirt with Cape ($6), Classic Jeans ($5) and White Canvas High-Tops ($8). He would make a great gift for the hero in your life or just a fun friend for your kids to play Super Heroes with. I was really impressed with monkey itself; he is very soft, adorable and well made. The clothes that he came dressed in are so cute too! All of the details on the clothing are wonderful and you can tell a lot of love & care go into making the clothes & the animals. Having never gone inside a Build-A-Bear store before, I was worried that the cost of the clothes would be a lot more expensive but I think that they are a good price for what you get. 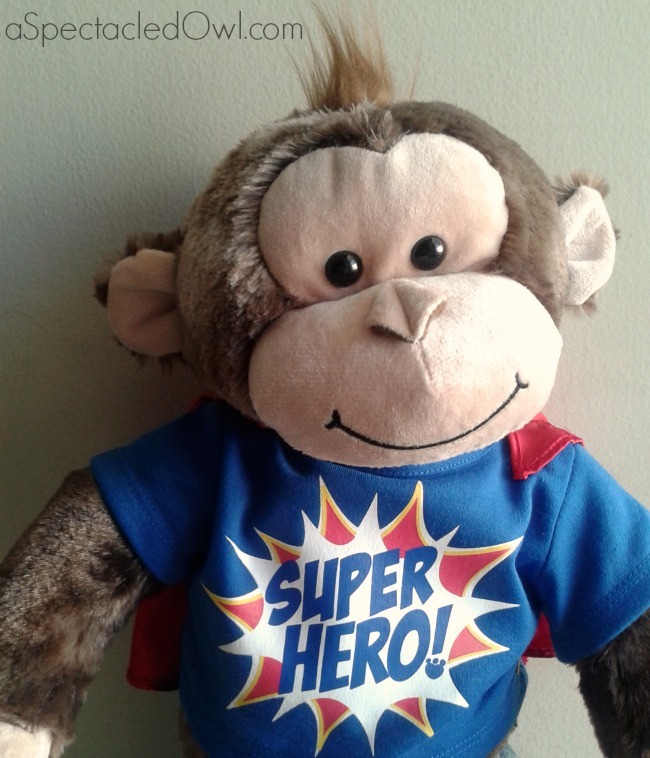 My 6 year old son is into Super Heroes and loved that this Monkey came with a cape attached to his shirt. My son thought it was great that he also has a shirt with a cape attached. 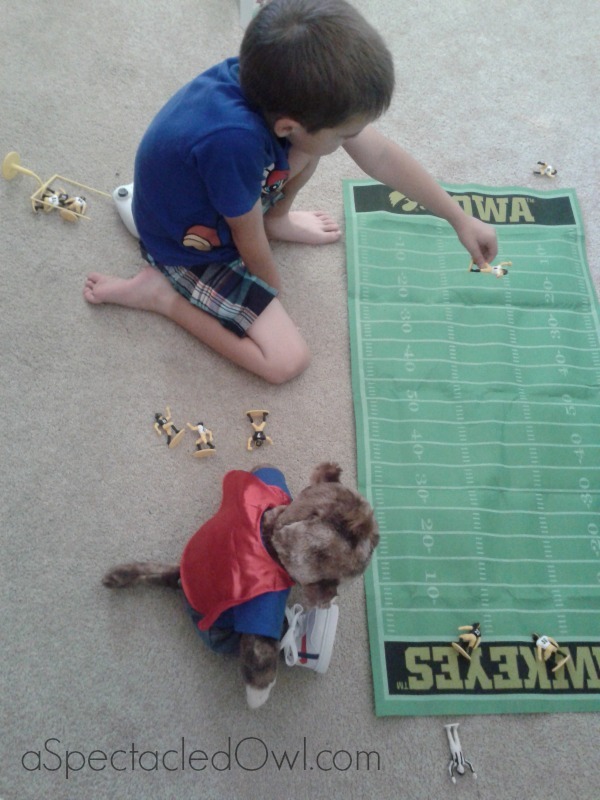 However, even with a copious amount of begging & bribing, Ryan refused to wear his cape shirt to matches Monkey’s. But. you can tell from these pictures that Monkey is being very much loved & taken care of. Ryan has loved making him fly around the house, play Legos with him & watch Pokemon with Monkey. Father’s Day: Surprise Dad with this rockin’ gift! Celebrate Father’s Day with Paperback Pup ($18) wearing a Dad Rocks T-Shirt ($8.50), Classic Jeans ($5) and Black Canvas High-Tops ($8). Plus, add a personalized message Dad will treasure with a Build-A-Sound® message YOU record. Armed Forces: Honor your favorite service man or woman with this cuddly Camo Bear ($20) dressed in a Khaki Digital Camo Outfit with dog tag ($13.50) and Black Rubber Boots ($7.50). Follow Build-A-Bear on Facebook, Twitter, Pinterest & Instagram. Plus, the have a blog that you can follow as well. Plus, we’re giving away a $25 gift card so you can head on over to Build-A-Bear to make your own special friend! Enter below on the Rafflecopter! I’d get the 14 in. Sweet Velvet Teddy for my newest nephew. I’ll get Catch Ya Later Build-A-Bear Buddies Lobster for my nephew. I would get the cute little pink penguin for my daughter. My daughter is obsessed with Rainbow Dash, so I’d get her a Rainbow Dash My Little Pony! Cora Jane would love this!! Great giveaway. Toothless for my little boy! He doesn’t have a Build a Bear yet. I would get the koala for my son. I normally take my kids every year for their birthdays but this year my husband got laid off. So this would be awesome. I would give it to my two kids, My daughter has been wanting a My Little Pony (Fluttershy) and My son wants Paperback Puppy. I’d get the 16 in. Big Top Bearemy for my nephew. One of the princess pets! 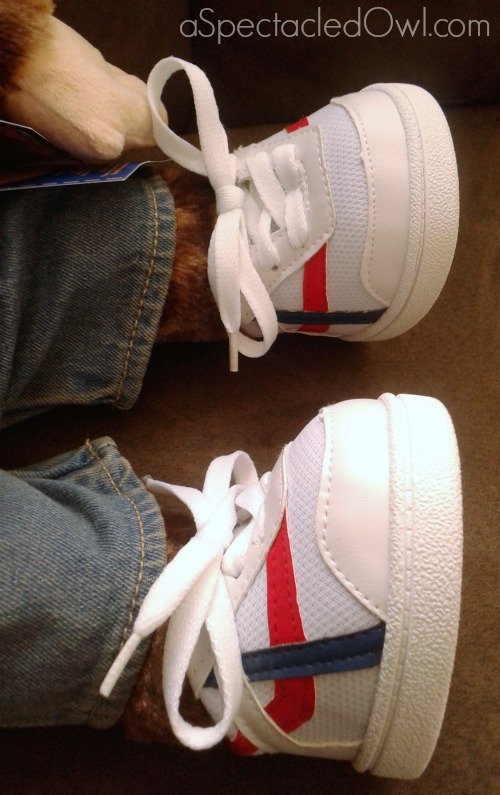 I would get my son the monkey…he has seen it and loves it! I’m not sure which animal we would end up with, but I would let my son choose! My daughter would probably choose the My Little Pony Build a bear! A cuddly beat for my little girl! I like the 14 in. Cute Caramel Pup and I would give it to my grandson. Oh I love the new beach ones! The 16 in. Toothy Shark is so adorable! I would love to give that to my grandson Carter!